5.3 Earthquake hits eastern Iran. 5.2 Earthquake hits the Fox Islands in the Aleutian Islands. Hurricane Guillermo is located about 1575 mi…2530 km WSW of the southern tip of Baja California and about 1720 mi…2770 km ESE of Hilo Hawaii with maximum sustained winds…80 mph…130 km/h. Present movement…WNW or 300 degrees at 16 mph…26 km/h. Tropical Storm 13w (Soudelor), located approximately 627 nm east of Saipan, CNMI, is tracking westward at 13 knots. Invest 94L is an area of disturbed weather in the North Atlantic that has the potential for tropical development. Vietnam – Flooding in northern Vietnam has killed at least 17 people, with the continuing rain prompting concerns of landslides and of pollution from inundated coal mines reaching one of the country’s most famous sites of natural beauty. Heavy rain began falling in the northern province of Quang Ninh on Sunday. Fourteen people were killed in the city of Ha Long and three in the city of Cam Pha. A summer of unusual heat in the Pacific Northwest is threatening to kill at least a quarter million sockeye salmon swimming up the Columbia River to spawn. 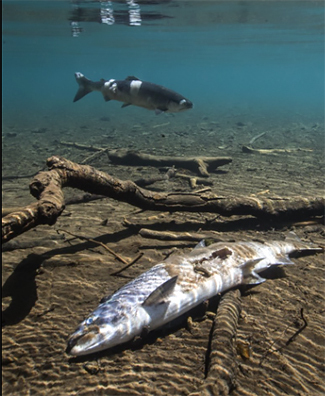 Large numbers of the fish have already perished due to prolonged heat above 100 degrees this summer, which have combined with low flows on the Columbia to create conditions that stress the sockeye and make them more susceptible to disease. The unusual warmth came as the Columbia saw the third-highest number of sockeye returning from the Pacific to spawn since 1960. With water temperatures in the waterway hitting the mid-70s, which is life-threatening to the fish, officials began releasing cold water from several reservoirs upstream in an attempt to prevent further fatalities. “We’ve never had mortalities at this scale,” said Oregon Dept. of Fish and Wildlife fisheries manager John North. Both Oregon and Washington have halted sports fishing in areas affected by the warmth. The week’s hottest temperature was 120.2 degrees Fahrenheit (49.0 degrees Celsius) at Al Qaysumah, Saudi Arabia. The week’s coldest temperature was minus 100.7 degrees Fahrenheit (minus 73.7 degrees Celsius) at Russia’s Vostok Antarctic research station. South Korean health officials declared an end to an outbreak of Middle East Respiratory Syndrome (MERS), which has killed 36 people in the country and caused widespread social and economic disruption since it emerged in May. The declaration came as U.S. researchers announced that an experimental MERS vaccine has shown promise in animal studies. The deadly virus first appeared in Saudi Arabia and nearby countries in 2012, leaving hundreds dead and health officials scrambling to contain it. The recent South Korean outbreak was the only one to emerge outside the Arabian Peninsula. Officials in Seoul were initially criticized for a slow response during the early days of the outbreak. But quarantine measures were soon introduced that confined nearly 17,000 people to their homes and kept the disease from spreading outside of medical facilities. The Ngamiland area in north-western Botswana was on Thursday put on high alert as some cattle appeared to show signs of the foot and mouth disease (FMD). Ministry of Agriculture spokesperson Jeffery Peko confirmed the suspected FMD cases, saying the movement of cloven hoofed animals and their fresh products within and out of the Ngamiland area has been suspended with immediate effect. Botswana recently announced that it has recorded a suspected outbreak of FMD in Chobe district in northern part of the country. A bacterial infection ravaging olive trees in the far south of Italy has spread to Corsica, where emergency measures are being implemented. Xylella fastidiosa, spread by insects, was found at Propriano in southern Corsica. The bacterium can also attack citrus trees and vineyards. France has destroyed plants around the infected bush found in Propriano. Xylella is one of the biggest disease threats to plants worldwide, the European Commission says. There is no effective treatment for infected plants and new Commission regulations say the only solution is to destroy them and establish Xylella-free buffer zones around them. Five hundred people north of San Francisco have been evacuated as a growing bushfire has consumed several buildings in less than 12 hours after it first ignited, fire officials said on Thursday. The blaze, called the “Rocky Fire,” is one of many in the state and started on Wednesday in Lake County, 110 miles north of San Francisco. The blaze rapidly spread to scorch 3,000 acres by early Thursday, according to the California Department of Forestry and Fire Protection (CalFire). The fire produced a smoky haze visible from 80 miles away in the wine-making region of Napa, where another wildfire has burned for a week and forced 200 people to evacuate on Wednesday. Crews battling fires kept a blaze east of California’s Napa Valley from jumping any more containment lines, fire officials said. Piton de la Fournaise (La Réunion): The expected new eruption, the third in 2015, started this morning at 09.20 local time. The eruptive fissure vent is located NE from Piton Kapor and extending towards Nez Coupé de Ste Rose. It feeds a curtain of lava fountains with associated lava flows. Access to the Enclos has been closed. 5.5 Earthquake hits near the east coast of Australia. Tropical Storm Guillermo is located about 1475 mi…2370 km SW of the southern tip of Baja California with maximum sustained winds…40 mph…65 km/h. Present movement…WNW or 285 degrees at 15 mph…24 km/h. Tropical Cyclone 02b (Two), located approximately 12 nm north of Chittagong, Bangladesh, is tracking at 05 knots. Tropical Depression Eight-E is located about 1110 mi…1790 km E of Hilo Hawaii with maximum sustained winds…30 mph…45 km/h. Present movement…W or 270 degrees at 15 mph…24 km/h. Tropical Depression 13w (Thirteen), located approximately 414 nm north-northeast of Pohnpei, FSM, is tracking northwestward at 14 knots. Invest 91E is an area of disturbed weather in the East Pacific that has the potential for tropical development. Nepal – Landslides set off by heavy rain struck several villages in Kaski, a popular tourist area in western Nepal, killing at least 24 people. At least 17 other people were missing, and the death toll could rise. Many houses were buried. Hawaii’s reefs are already reeling from their worst coral bleaching event in recorded history in 2014, when record warm ocean temperatures caused 50 – 70% of the corals sampled in Northeast Oahu’s Kāneʻohe Bay to bleach. When the sea surface temperature is 1°C warmer than the highest monthly mean temperature corals usually experience, coral polyps will expel the symbiotic algae that live in their tissues, exposing the white skeleton underneath, resulting in a white “bleached” appearance. Death can result if the stress is high and long-lived. In Hawaii’s waters, corals cannot tolerate water temperatures above 83°F (28.3°C) for multi-week periods without suffering bleaching. Corals typically recover from mild bleaching, gradually recovering their color by repopulating their algae. However, if the bleaching is severe or prolonged, individual polyps or whole colonies will die. With Hawaii likely to undergo a second consecutive year of record warm waters and coral bleaching in 2015, widespread mortality in many of Hawaii’s coral reefs is possible, particularly around the Big Island. Between 16 and 25 July 2015, the National IHR Focal Point for the Kingdom of Saudi Arabia notified WHO of 8 additional cases of Middle East respiratory syndrome coronavirus (MERS-CoV) infection, including 1 death. The New York City Health Department is investigating an outbreak of Legionnaires’ disease in the South Bronx. Thirty-one cases have been reported since July 10, including two possible deaths. The Health Department is also testing water from cooling towers and other potential sources in the area to determine the source of the outbreak. New Yorkers with respiratory symptoms, such as fever, cough, chills and muscle aches, are advised to promptly seek medical attention. The Catalonia region of Spain has seen its biggest forest fire this year, with more than 1,200 hectares (3,000 acres) burned in less than 24 hours. Helicopters have been used to contain the fire, which broke out on Sunday. Some 400 people were forced to leave their homes, but authorities said there had been no reports of injuries. Fires burning in drought-parched California on Tuesday menaced thousands of structures as firefighters struggled to corral the blazes there and elsewhere in the U.S. West. The so-called Lowell Fire north of the state capital Sacramento has injured four of the 2,277 firefighters battling it. One firefighter was hospitalized with serious burns. Roughly a third of the 2,233-acre blaze was contained as of Tuesday morning, with low humidity and high heat expected throughout the day. Roads were closed and evacuation warnings were in place around the fire, which was threatening about 1,800 structures. To the south, a 1,739-acre fire forced the evacuation of campgrounds in the Sierra National Forest and threatened some 450 structures, including homes and vacation cabins. The so-called Willow Fire, north of the central California city of Fresno, was only 5 percent contained as of Tuesday morning. Piton de la Fournaise (La Réunion): A new eruption might be under way at the volcano. Since last weekend, seismic activity from a source at 1-2 km depth beneath Dolomieu crater has been increasing. In addition, increased degassing and inflation of the Dolomieu crater have been detected, both likely signs of a new magma intrusion at shallow depth. The prefecture has closed access to the Enclos. Whether an eruption will occur or not remains to be seen in the coming hours or days. If it does, it would be the third eruption of Piton de la Fournaise in 2015 after the ones in February and May. Already on 6 July, a similar seismic swarm occurred, but was not followed by an eruption. More than 90 quakes within one hour triggered an eruption alert and the Enclos was closed to the public. The caldera was reopened (with some limitations) on 9 July. 6.5 Earthquake hits southern Alaska. 5.9 Earthquake hits the Panama-Colombia border. 5.4 Earthquake hits the Fox Islands in the Aleutian Islands. 5.2 Earthquake hits Libertador O’Higgins, Chile. Tropical Depression Eight-E is located about 1525 mi…2450 km WSW of the southern tip of Baja California with maximum sustained winds…35 mph…55 km/h. Present movement…W or 270 degrees at 13 mph…20 km/h. Pakistan Update – The nationwide death toll from this month’s flash floods in various parts of Pakistan rose to 81 on Tuesday as floodwater inundated hundreds of villages, leaving tens of thousands of people homeless. The floods have affected 300,000 people in the two weeks since deluges hit the northern city of Chitral and the eastern Punjab province.